X PROMOTION DISCLAIMER: Limited time only! Offer expires Friday, 04/26/19 @ 11:59pm CST. In order to redeem your 10% OFF Mother's Day Gift Guide discount, you must enter and apply code GIFTMOM into the Shopping Cart page during checkout. The 10% OFF discount applies to select items only that are located within the Mother's Day Gift Guide on the website found here: https://www.leatherology.com/mothers-day-gift-guide/. Discounts are not valid on styles with Hand Paint, and are exclusive of taxes and shipping charges. Discounts may not be combined with other offers with the exception of free economy shipping on orders $100 or more. Discounts may not be applied to Corporate orders or combined with volume discounts. Product must be in stock to receive the discounts. Offers may be modified or terminated at any time. X FREE US SHIPPING DETAILS: Free US Economy Shipping is available on orders totaling $100.00 or more (net of discounts, taxes, and any shipping charges). The Free US Economy Shipping or $5 Flat Rate Economy Shipping option will be automatically available in the shopping cart after you enter a qualifying US zip/postal code. Offers for free economy and $5 flat rate economy shipping are valid only for orders shipped within the 48 contiguous United States (excluding Hawaii, Alaska, Puerto Rico, Canada, and Australia). Offers may not be applied to Corporate orders, combined with volume discounts, or applied as partial payment toward the cost of other shipping methods. Offers may be modified or terminated at any time. SIGNATURE COLLECTIONOur signature collection of high quality, cowhide leathers in classic colors. PREMIUM COLLECTIONOur most exclusive pieces, made from Italian and German leather. We can help you customize the perfect promotional gift for conferences, weddings, and special events. Volume pricing discounts are available on qualifying orders. Custom logo debossing is also available on qualifying orders. Click below to learn more about our program, or Inquire Now for a quote. This item can be made uniquely yours with a monogram debossed into the leather by hand. Blind or foil color options are available. Extra per item charges apply for personalization. Please select a personalization option. 1 CHARACTER ONLY. UPPERCASE ONLY. We offer up to four font sizes- XS, S, M, and L.
The font sizes available vary by product; on some products you can choose your size, while on others our product and monogram teams have carefully pre-selected a size for you. Please Note: Personalized items cannot be exchanged or returned. We offer blind (no color) and multiple foil color deboss options. The deboss colors available vary by style, and our full range is pictured below. Please Note: This preview is approximate. Personalized items cannot be exchanged or returned. Free US Economy Shipping is available on orders totaling $100.00 or more (net of discounts, taxes, and any shipping charges). The Free US Economy Shipping or $5 Flat Rate Economy Shipping option will be automatically available in the shopping cart after you enter a qualifying US zip/postal code. Offers for free economy and $5 flat rate economy shipping are valid only for orders shipped within the 48 contiguous United States (excluding Hawaii, Alaska, Puerto Rico, Canada, Australia, and the UK). Offer may not be applied to Corporate orders, combined with volume discounts, or applied as partial payment toward the cost of other shipping methods. Offer may be modified or terminated at any time. Never lose track of your keys again. Made with a chic hand-stitched tassel, this keychain will make finding your keys in your bag a breeze. A clip is also attached to this style so you can clip this keychain to your bag or backpack - perfect for easy retrieving. Our Classico leather collection is a semi-aniline, drum dyed pebbled leather. It offers a little extra color and character, making it a good choice when you want your accessories to stand out. This full grain leather has a soft hand feel with intricate lines, giving it a distinct look from our smoother leathers like Vero and Zita. It comes in a wide variety of colors that you won't find in our other collections and has a polished finish to make them really shine. Its unique appearance and range of colors make it ideal for matching with purses, belts, or other leather items you own. An earthy grey brown, Taupe is pulled from seaside rock formations found along the California coast. Similar in hue to our Ginger leather, pick Taupe if you want something a little darker. Whether you are treating yourself or giving a gift to someone else, we want you to have an amazing and memorable experience. All items will be shipped using our signature gift packaging. Depending on the type and size, your item(s) will come wrapped in our signature microsuede sleeve, drawstring bag or soft velour bag (each with black tie accents), and be packaged inside a high-density bronze gift box. You will also have the opportunity to add a personalized gift message when you place your order. All of this extra attention to detail is complimentary. I kept my keys on a lanyard and the bulkiness of this set up became a real pain. 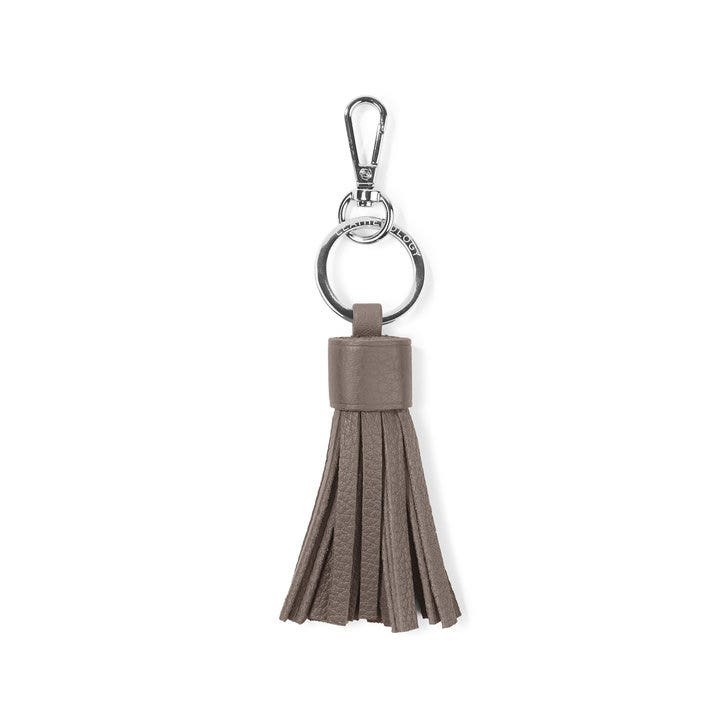 Small in size, this key tassel does the job without the hassle of digging through my bag. Thanks Leatherology! These tassels add just the perfect flair to any purse, well worth the price! Great quality, quick shipping, nice packaging. Prefect girlfriend gift. I was delighted with my purchases (3 items)- all were beautifully made and the packaging for delivery was quite a presentation! Lovely. Leatherology will surely be a go-to site for gifts and me. The leather is soft and the keychain is big enough for me to keep up with inside my purse. I really like the plum color too. Last year, I gave my sister one of your totes. She carries it DAILY. Leatherology bookmarked for all of my future gift-giving. the colors are divine. wish someone would give me a couple! so many keys, so few chains! Excellent! Wish someone would give me one in cobalt! Sign up to receive exclusive offers, sneak peeks, a birthday surprise and more! You're in! We emailed you a $10 OFF promo code. Nice to see you again! You're already on our list, so you'll continue to receive new product and special offer notifications. © 2019 Leatherology. All rights reserved. You're already on our list, so you'll continue to receive new product and special offer notifications. Keep an eye on your inbox for Insider perks. Click to apply your $10 OFF discount. This pop-up will only appear once, so don't miss out! You may unsubscribe at any time.